It’s not a short subject so please read thoughts on this aspect of the race here. It wasn’t just the two Red Bull drivers tussling over team orders on race day, Mercedes found themselves in the enviable position of battling over the last step of the podium. But as per the rules team ordes are allowed and therefore they can be enforced, but as can be seen from the incident above it isn’t a black and white matter. Similar to Vettel, Rosberg also asked for some assistance in getting past him team mate ahead, but whereas Red Bull lost control of the situation Mercedes kept their drivers in line, with Hamilton ahead. Rosberg asked on two separate occasions for Hamilton to be told to move over, and twice he was told ‘negative’. Brawn made it abundantly clear to Rosberg that the most important objective was to have a double points finish. After Rosberg explained he could go faster, Brawn replied, “Negative Nico, negative. Lewis’ pace is what we are asking him to do. He can go a lot faster as well, so please be in control as well. There is a massive gap behind and nothing to gain in front. 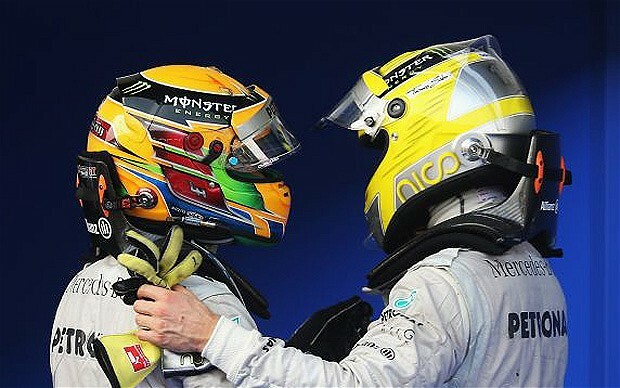 I want to bring both cars home.” Rosberg would have had to suppress his racers instinct to follow orders, but he did and remained magnanimous in fourth place, but was sure to send a barbed warning for the future, “Remember this one.” Like Vettel Hamilton conceded that his team mate should have been in his place, but without a win in the balance their relationship should weather this well, but it just goes to show that Rosberg isn’t going to be a walk over. Several teams had trouble getting their men though a pit stop without a problem, Force India must be the first to be mentioned as both of their drivers suffered the most, especially so after showing great promise before the lights went out. Frustration bore out after their captive wheel nut system had issues in the first round of pit stops in which Force India had stacked their drivers, with Sutil first in di Resta was stationary behind him for around 15 seconds, an age in Formula One (Sutil [lap 6]: 37.833, di Resta : 43.713) . It happened during the second stop and the team decided then to retire both cars on safety grounds (di Resta : 123.124, Sutil : 89.401). Pic also suffered when Toro Rosso released Vergne too early from his pit box, the Caterham driver was pulling into his box when Vergne collided with him, both drivers consequently required new noses. Although this cost the elder Frenchman time he still scored Toro Rosso’s first point of the season which begins the march to what seems to be the empty seat at Red Bull in 2014. 4. Where art thou Ferrari? The signs were incredibly promising at the start of the race, it seemed likely that Vettel was going to find himself mugged by two horses at the start and he almost was. 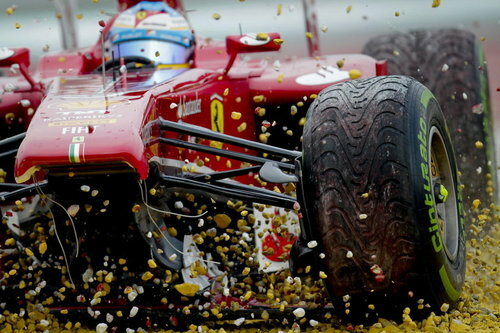 Alonso clashed with Vettel on turn two during the opening lap and damaged his front wing, but even with one end catching on the track surface he kept himself ahead of a punchy Webber. It seemed common sense to bring him in after he nursed it through the rest of the lap, however Ferrari decided to keep him so they could combine a new nose with fresh tyres. The kicker is that those who were involved in that decision couldn’t see the shower of sparks he was creating, confusing when Button was warned about Alonso. Massa then was left as the lone pony and couldn’t quite put up the challenge expected, but he hauled in enough points to finish the weekend ahead of his team mate. Yearning for the familiar Lewis? No, when the pressure is on to hit your pit box right instincts take over spending six years at the same team your instincts remember those six years. Hamilton pulled into the McLaren slot and had to be waved on so he could find the Mercedes mechanics, cue mirth and laughter from the McLaren garage and his girlfriend. He won’t be making that mistake again, especially as McLaren are finding things a little tough out there. Things were looking brilliant for McLaren, the hotter weather seemed to suit them as they took a step forward in performance and it was happy faces all around. Button started well and he was running in fifth with his eyes firmly set on a podium finish, until a pit stop saw fit to dash his hopes. In 2011 at Silverstone his front right tyre wasn’t fitted properly and he was forced to stop in the pit lane exit, this time it was the same tyre but he only got a hundred feet away from his team. At least Perez scooped up two points. 7. Team Orders, Last Orders? It’s something Formula One as a whole will perhaps have to look at in terms of audience perception. Team orders have been part of the sport since its inception, but in an age of Hawkeye (Tennis), replays (rugby) and court cases over match fixing fans want a transparent fight. It was why team orders were given the okay in the first place, so to ban them again would involve covert codes, oddly timed pit stops and the like to creep back in. It’s a line the sport will dance upon and around forever.